With the explosion of quality music coming out of Sweden, Norway, and Finland over the last few years, it’s worthwhile to look back and remind ourselves that excellent rock from Scandinavia is not a new thing at all. 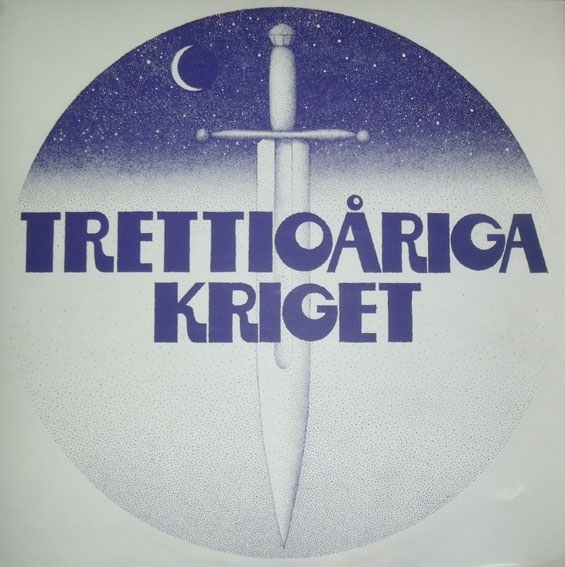 Trettioåriga Kriget is a case in point, and their 1974 debut album can clearly be seen as a precursor to a lot of the music made by later generations of their countrymen and women. The band had been together for several years by the time they recorded this music, and it shows in the confidence of their playing and the distinctive sound they present. It’s as if they had already gone through a band’s normal formative time, when they tend to sound derivative of previous music, and had the good fortune not to release an album until they had discovered their own identity. Or maybe they sprang forth fully formed like Athena from the skull of Zeus — later archival releases would provide some clues, but when Trettioåriga Kriget came out, it was quite distinctive. In general, it is guitar-based rock with occasional keyboard support and strong vocals singing in Swedish, but their riffs are far from typical 70s fare. I am sometimes reminded of Captain Beyond, the way the parts sound like they are generally rooted in the blues but taken well past any standards and infused seamlessly with odd meters. There are a lot of sophisticated and unexpected chords, and the arrangements are full of twists and turns. The rhythm section of Stefan Fredin (bass) and Dag Lundqvist (drums) is simply outstanding, with Fredin’s bass taking an aggressive tone that really drives the music (a bit like Chris Squire in early Yes recordings) and Lundqvist taking some of the elements of 60s psychedelic rock into new territory with precision and energy. The two guitars of Christer Ackerberg and Robert Zima provide imaginative parts, with aspects of Carlos Santana, Jimi Hendrix, and others, and including many jazzy voicings. In short, Trettioåriga Kriget is a real gem of a past era that still sounds great today, and it well worth investigating in today’s world of assembly-line music.